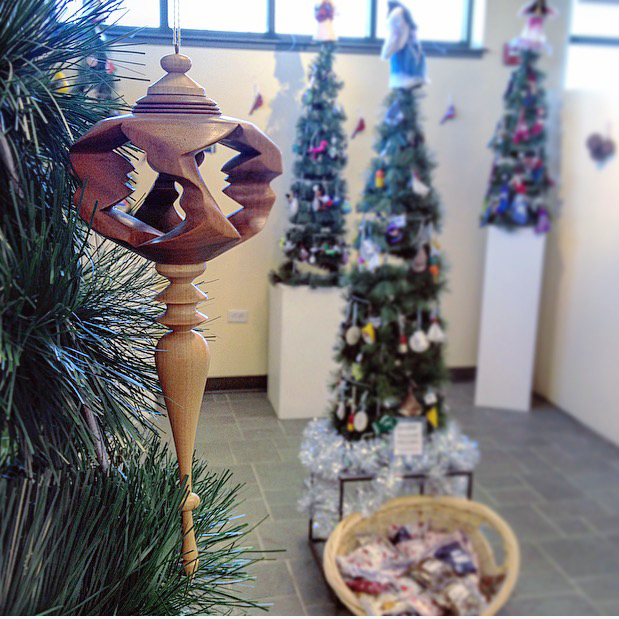 Our Annual Ornament Show features beautiful, handmade ornaments and decorations in a range of craft mediums for the season by MCA member artists. You’ll find Cardinal Wall Hangings by Patti’s Machine Quilting, Snowflake Blocks by Nail Art, Balsam Pillows by Maine Sales Company, Tree Top Angels by Donna Lausier, Clay Wall Tiles by Lisa Gilman and much more! Shop the Center for Maine Craft retail gallery and exhibition space, located at 288 Lewiston Road in the West Gardiner Travel Plaza; open every day from 9am-8pm. The Center will close at 4pm on Christmas Eve. Featured Artists: Carolyn Kemp, Wayne Village Pottery, Al Mather, Priscilla Clark, Gary Poisson, Erlynne Kitagawa, Donna Lausier, Lola Arts, Lisa Gilman, Mudgirl Pottery, Kaitlyn Duggan Pottery, Maine Lights Collection, The Knotty Shop, Ember Grove Gallery, Jeanne Seronde Perkins and Ebenezer Akakpo.